A set of clubs, golf bag, golf shoes with non-metal cleats, a couple sleeves of balls, a handful of tees, a divot tool and away you go. For those new to golf, or perhaps looking to get back into the game after some time away, the first step is to find the right equipment. Start with the basics: clubs, balls, a bag and shoes. While there is a host of more-peripheral equipment that can aid new and seasoned players, those are what every player needs. This is where any golfer should start. Most beginning golfers purchase a full set of new or used clubs. These sets often include a driver, two or three woods, several irons, a pitching and/or sand wedge and putter. Other clubs can be purchased individually, such as hybrid clubs and specialty wedges. There is a wide variety of balls on the market, including those that are designed to aid driving distance and others designed to improve accuracy. For new golfers, purchasing a couple of boxes of golf balls to start is imperative, since that first trip to the links is likely to result in a few lost balls via hooks, slices and water hazards. Every hole on a golf course features a tee box. Hence, tees are imperative to playing golf, particularly on par 4s and 5s, where teeing it up with a driver or 3-wood is a common approach to a hole. Tees come in a variety of lengths and materials. After a golfer purchases clubs, tees and golf balls, the question of where to keep all of them comes into play. Fortunately, there are plenty of golf bags on the market, ranging from low-cost bags with basic amenities to intricate designs with pockets aplenty. For new golfers, purchasing a new set of clubs with a bag included might be the best practice, as it can often result in savings. 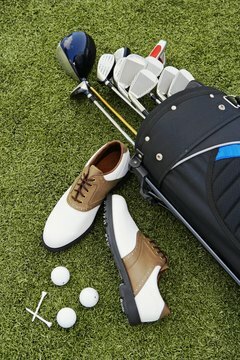 While not required on all courses, rubber-cleated golf shoes are beneficial to new and experienced golfers alike. Golf specialty shops and course pro shops carry these shoes, as do most major sporting goods retailers. Make sure to purchase a comfortable shoe, as an ill-fitting shoe can wreak havoc on golfers' feet during a long round on the course.